A widely-recognized shortfall of many software inventory tools is their utilization of data found within file headers and/or registry entries to perform the complex task of identifying software. While this "raw" application data provides important clues that aid in software recognition, it's virtually impossible to obtain a reliable view of installed software without cleansing, classifying, and normalizing that data into a taxonomy that relates to how software is actually licensed. 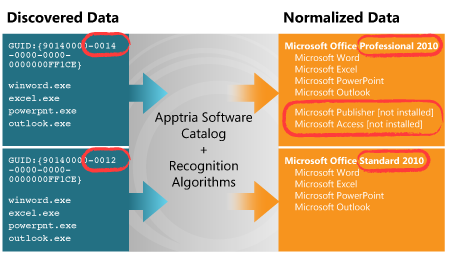 The Apptria Software Catalog allows data points collected from discovered executables and registry entries to be mapped to their proper software titles, versions, editions, and manufacturers. Most applications consist of more than one executable. Without proper recognition and rationalization, multiple related files may be incorrectly interpreted as independent applications or, in some situations, not identified at all. Such errors can only be ascertained and corrected manually, an overwhelmingly tedious and time-consuming process. The Apptria Software Catalog contains information that enables your product to group all discovered executables that comprise a single application, so that data can be evaluated from a licensing perspective. Traditional methods of software recognition depend on software publishers to provide consistent information across all products and all product versions. Unfortunately, it's rarely the case that this information is consistent from release to release (let alone across an entire product line), even among the most reputable manufacturers. The Apptria Software Catalog normalizes all the variations of any given software title, version, or publisher into consistent, familiar nomenclature. For example, software license agreements often allow for simultaneous versions or multiple copies of an application to be installed. Without normalization of inconsistent file headers, discovered executables can't be grouped under a common application title. This can present a significant challenge from a license management perspective because each version or installation may be mistakenly viewed as a separate application requiring its own license. The Apptria Software Catalog allows all versions of a given application be consolidated under a standardized application title and manufacturer, while still preserving the versioning information. Identification methods that rely solely on executable file information generally lack the detail necessary to distinguish between different editions of applications that share a common executable. This is the case, for example, with Microsoft Project Standard and Microsoft Project Professional—a critical distinction to make from a license and cost standpoint. The Apptria Software Catalog also contains registry-based information (in the form of GUIDs) which enable proper identification of such applications. Methods that analyze the registry will identify the presence of a suite but generally won't reveal which components of the suite are actually installed. This makes it extremely difficult, for example, to collect software usage data on individual programs in order to determine whether they are actually being utilized. Other techniques that rely on executable file information alone may recognize the individual suite components, but cannot provide the information necessary to identify the exact suite configuration. The Apptria Software Catalog uses GUIDs in conjunction with executable file information, making such analysis possible. Get Started: Contact us to learn how we can help your business deliver superior application recognition to your customers. Copyright© 2011-2019 Apptria Technologies, All Rights Reserved.